This post is only for people who like really really tasty things. If you don’t, then you won’t like this. 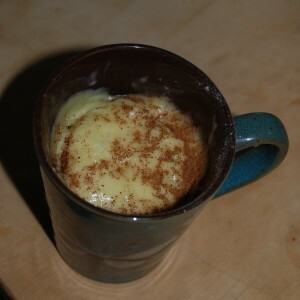 Lately I have been making a lot of desserts in the microwave due to lack of oven. Most recently I made this sugar cookie recipe and it was pretty tasty. Many thanks to Melissa at No. 2 Pencil for being a genius! After a few times of eating that I decided I would take her recipe and make it chocolate chip, even though she had a chocolate chip recipe I didn’t want to look it up and figured it probably just substituted half the white sugar for brown. Also there are no chocolate chips here, but whatever. I made it the way I thought and it was super tasty. I looked hers up later and hers is slightly different. I’m sure just as tasty. A week or so ago we made snickerdoodles at the house of friends who own an oven. Since then all I want to do is eat snickerdoodles. This morning at breakfast time (don’t judge!) I realized I could make one in the microwave! So, without further ado here are two ways to make snickerdoodles in your microwave. First melt butter in a nice microwavable mug. Then add sugar, salt, cream of tartar, and egg yolk, mixing them all together. Then add the flour, and mix it up real good. Sprinkle a liberal amount of sugar over the top, and as much cinnamon as you like. If you are me you will cover the entire top with cinnamon. Microwave for 30-45 seconds depending on how strong your microwave is. Then enjoy. It was super tasty and I loved it. This is probably not enough to share with another person. The steps to making this are just like above except cook 45-60 seconds. I made this version to share with the 3 other mouths that live at my house. In truth I probably only shared 7 small bites though. I actually preferred this version, and Aaron said it was delicious, but was almost more like a cake than a cookie. Either way, I highly recommend this tasty treat, especially if you don’t have an oven and are craving snickerdoodles. You’re welcome. 5 Responses to Snickerdoodle Mug Cookie. You’re welcome. I remember my non-oven days. Those were sad sad days! We bought an over with our first or second paycheck in China. (of course we did not have to by beds, refrigerators, tables chairs couch or a million other things you have purchases) How pricey are they there? We got our for about $100 but it was just a cupboard top one. It worked great though. It cooked t-day dinner for us. Oh, the memories. Did the egg blow up in your eye? Oh, yum! A little taste of home goes a long way. Microwavable cookies. I just may make some myself right now. Yummy! I ran out of cinnamon but it was great! And it lasted me a long time! It took maybe 12 minutes to finish! Definitely keeping this recipe! I have a request for you to try! Can you try making a lemon blueberry mug cake with no milk? We ran out but I am craving it!!! Please!